Interests:Local and Family History research.General Secretary Photograph and Newspaper Librarian for Bacup Natural History Society. Webmistress bacuptimes.co.uk and bacupnaturalhistorysociety.co.uk Author of Owd Bacup, Owd Stacksteads, Where Heroes Rest The Great War Dead of Bacup Cemetery, Bacup Home Front WW1.Tales of the Bacup Times, Nursing Heroes the Story of Fern Hill. I came across this article in my local 1916 paper and thought it may intrest others, it is a exact typed copy of the article. 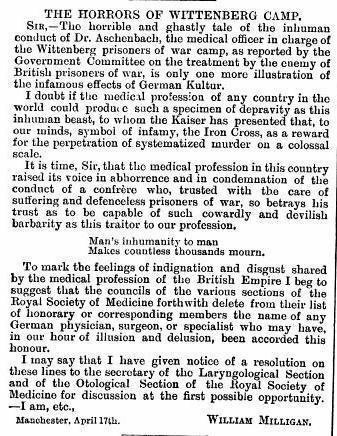 Terrible revelations of the conditions prevailing in the Wittenberg prisoners of war camp in Germany during the typhus outbreak, which occurred at the end of 1914 and early in 1915, are given in the reports of the Government Committee of Inquiry, presided over by Mr Justice Younger. The report is based on the statements from repatriated prisoners of war, and especially from Major Priestley, R.A.M.C. Captain Vidal. R.A.M.C. and Captain Lauder. R.A.M.C. the only survivors of six British doctors sent from another camp to take the place of duty abandoned by the German medical staff when the typhus manifested itself. The camp was grossly overcrowded. While typhus was raging 15,000 prisoners ( 700 ) British were contained to it’s ten and half acres. Though the winter of 1914-1915 was extremely severe, there was a great shortage of coal, the men were insufficiently clothed, they were given no change of underclothing, the washing and sanitary arrangements were very inadequate, the food was bad and insufficient. The epidemic was due to these conditions. When Major, Priestley arrived the prisoners were gaunt, of a peculiar grey pallor and verminous. The German authorities though not ignorant of the dangers did nothing to prevent or minimize the spread of infection. When Captain Vidal asked that the remaining healthy English might be placed together in one compound his request was insultingly refused. The epidemic broke out in December 1914. The German staff, military and medical precipitately left the camp, and until August, 1915, with two exceptions communication between prisoners am their guards was by means of directions shouted from the guards or officers remaining outside the wire entanglements. All supplies were pushed into the camp over shoots. The food for the hospital was passed in on a trolly over about twenty yards of rail worked by winches at either end so as to avoid all contact between the prisoners and the outside world. No medical attention during the whole time was provided by German staff. The six British doctors sent to the camps had, in defiance of the Geneva Convention been detained as ordinary prisoners of war at Halle. On arrival at Wittenberg they were marched to the camp. They visited the different compounds and were received in apathetic silence. The rooms were unlighted, and the men were aimlessly marching up and down , some were lying on the floor probably sickening for typhus. When they got into the open air again Major Fry, broke down. The horror of it all was more than he could for the moment bear. No mattresses were supplied in the improvised hospital. The result was that many typhus patients would not go into the hospital they hid their condition as long as possible. The diet was hopeless for patients in a fever. In truth the ration was not a ration at all it was a pretence. It was not even possible to give the patients warm water with their milk. Major Fry and Captain Sutcliffe died of typhus about a month after their arrival Captain Field died later. There is no doubt in the minds of the committee that the conditions to which the camp authorities had reduced the campo and prisoners they had abandoned were directly responsible for the deaths of these devoted men. Captain Lauder alone of the officers attacked finally recovered. When convalescent he bravely continued his duty. The dead were buried in a cemetery formed out of a part of the camp. The Germans sent in a certain number of coffins every day, into which the bodies of the dead were put and carried out by their comrades, through a gate in the barbed wire. There was not sufficient room for the burial of so many, and the coffins were piled one upon another. What the prisoners found hardest to bear were the jeers with which the coffins were frequently greeted by the inhabitants of Wittenberg, who stood outside the wire and were permitted to insult the dead. There were between 250 and 300 English cases and 60 deaths. Captain Vidal says that the conditions were thoroughly realised by the German authorities without any effort being made by them to bring about an improvement. Savage dogs were habitually employed to terrorise the prisoners, flogging with a rubber whip was frequent, men were struck with little or no provocation, and were tied to posts with their arms above their heads for hours. Captain Lauder reports that many of these men went so far as to look upon the typhus with all its horrors as a god-send; they preferred it to the presence of the German guards. The commandant during the whole time was General Von Dassel. The committee believe that he had now been removed from a position which he always was unfitted to occupy. Dr Aschenbach, however remains medical officer, and no confidence can be felt that so long as he is there the prisoners will have the medical care to which they are entitled. On one occasion during the whole course of the epidemic did Dr Aschenbach enter the hospital, or even the camp. He came attired in a complete suit of protective clothing, including a mask and rubber gloves. His inspection was brief and rapid. For his services in combating the epidemic. Dr Aschenbach, the committee understand has been awarded the Iron Cross. Cpt Vidal's official report is in WO161, on line from the NA and reads very much the same as the article. In case it doesn't the book is "My Four Years in Germany" by James W Gerard. There is a large file on Captain Vidal in the Army Medical Services Museum containing his letters, various reports and some patient details. Do I have to go to the Army Medical Services Museum to access this information? Just more general information about Wittenberg camp and the everyday life there as my grandfather Herbert Booth Hughes (HLI) spent most of the war there.He came back from the war but died from TB not long after. Picture second from bottom RHS. I have just looked through the file and the patient record book and can not find your grandfathers name listed so presumably he was not admitted to the hospital. Many thanks for posting this very interesting account of events at Wittenberg. It must have been absolutely dreadful to have been there and to have endured those conditions. I recently discovered a photograph of a memorial to British Officers, NCOs and Men who died at Wittenberg in an album which belonged to my wife's grandfather. I am not sure how my wife's grandfather (3rd Battalion Gordon Highlanders) came by the photograph as he was a POW in Alten Grabow for most of the First World War. The only possible connection seems to be that he may have known the Gordon Highlander commemorated on the memorial. A photograph of the memorial can be seen on my website, Reminiscene, either through the Scottish Soldiers page at http://www.reminiscene.co.uk/scottishsoldiers.htm or directly at http://www.reminiscene.co.uk/photographs/dah0033.jpg. Thanks to a good photograph and the aid of a magnifying glass, I have been able to transcribe the names on the visible panels of the memorial and you can find this at http://www.reminiscene.co.uk/wittenbergmemorial.pdf. The names include Major Fry and Captains Sutcliff and Field. Does anybody know whether the memorial is actually located in Wittenberg? My grandfather, a Belgian named Maes Felix Victor was also at Wittenberg as a civilian and was hit by typhus. Is there anything you can find in de list you have regarding his admission to the hospital? I can not find any civilian details I am afraid. I have a photo taken in April of the memorial with your grandfather's name on it. E mail me if you would like a copy. This is an article I could find on the web from april 22, 1916 in a medical journal. Hi Pete, My Great grandfather served with the 1st Battalion Loyal North Lancashire Regiment and was captured by the Germans on 21/22nd Dec 1914 at Givenchy. He was 4081 Pte Robert Mather from Preston. 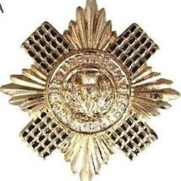 He was mentioned for his service volunteering as a medical orderly during the typhus epidemic and awarded the Meritorious Service Medal. I would love to know more about this camp and if there is any mention of him on any records? I am researching my great grandad Philip Felix Wright who died in Wittenberg POW camp on 20/04/1915. He had been working as a medical orderly helping the men who had typhus before contracting the disease himself. Would anyone have any other information about Philip ie where he was buried and why his name does not appear on the memorial for those who died. He was a Lance Corporal with the Loyal North Lancashire Regiment. Regimental number 3104. He would have been c54 when he died and he had previously served with the British Army in the 2nd Boer war. I recently discovered my Great uncle Percy Lucas (Service No.3952) of the Royal Welsh Fusiliers was captured at La Basse and was transferred to Wittenberg P.O.W. Camp. Records that I found through the international Red Cross showed that he died in the barracks hospital in February 1915, the cause of death given was 'Lungenentz ' which I am assured translates as 'Pneumonia '. And having read the reports on this camp it did not come as a surprise that he suffered such an awful death.